I would like to thank you for your many distinguished years of military and public service. The work you’ve done is extraordinary. Your true American story is inspiring and speaks to what is possible in this great nation. Mr. Powell, I have deep respect for you. It’s becoming increasingly ostensible that you’re no longer a republican. You’ve voted for President Obama in the last two presidential elections and have been fiercely critical of the Republican Party for the last 8 years. While there’s certainly nothing wrong with being critical of one’s political party, you seem to find nothing you like about the party any longer. You, however, have no problem with finding things you like about the Democratic Party and President Obama. If you really believe that the Republican Party does not value minorities, then why are you still claiming to be a republican? Why not change your political affiliation? Are you masquerading as a republican when you’re really a democrat for the potential political benefits this can offer the Democratic Party? Are you really that thrilled with the Democratic Party in the last 8 years, or do you just have a fondness for President Obama? If you’re using the label of republican against republicans, then it’s having little to no impact on voters. You’ve never really been too comfortable in the Republican Party in the first place. Why continue to experience this discomfort? Would the Democratic Party make you feel more comfortable, or would you feel more relaxed as an independent? Are you enjoying the spotlight that your opposition to republican presidential candidates gains you? Do you feel the need to have substantial national political power and see this as your way to command this desired power? The policies, values, and worldview of President Obama are diametrically opposed to the Republican Party. You’ve given the policies, values, and worldview of President Obama ringing endorsements. You cannot honestly admit that you’re committed to the Republican Party. What would it hurt if you changed parties? Someone with an illustrious record as you have is more than entitled to do what you please. If you’re truly a republican, then publish a piece about why you’re a republican and how you reconcile this with being a zealous supporter of President Obama. 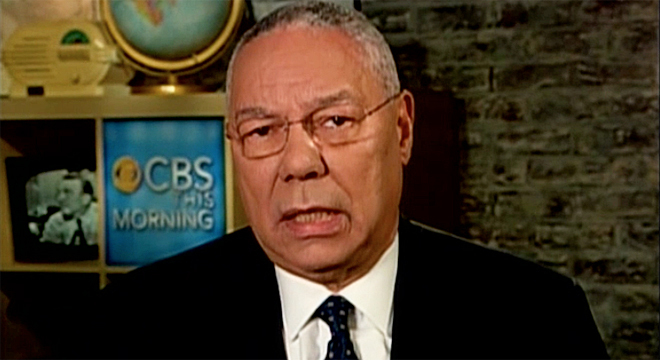 Mr. Powell, you’ve given many people the right to question the authenticity of your claim to be a republican. Don’t get angry when people question your genuineness about being a republican—simply explain to them why you are. Many democrats, republicans and independents are curious about why have elected to remain a republican. Would it be best for you to sever all ties with the Republican Party?